This was a fun idea that my daughter and I created after seeing some similar ideas on Pinterest. I used the wreath as decor for my sister's baby shower and then gave it to her as a gift. 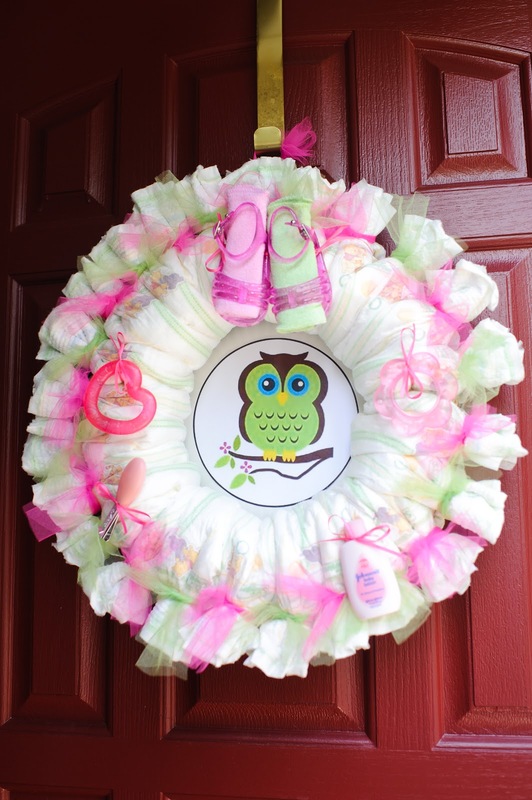 To see the full owl themed baby shower click HERE. Wrap diapers around wreath securing with rubber bands. Tie tulle onto each diaper to hide rubber bands. Use ribbon to tie baby items to wreath. I put the ribbon through the diaper and secured the item to it tightly with ribbon. Glue design to back of paper plate and hold punch each side. Tie plate onto the back of the wreath with ribbon going through a diaper on each side. Use tulle to create a loop to hang the wreath. This project is posted on THESE GREAT PARTIES!!!! Aw, so sweet! Very pretty. This was just too cute:) I had to double check about the baby diapers:) Thank you for sharing at Freedom Fridays. Love this! What a great way to give the Mom to be diapers and to decorate :) Thanks for sharing. I love that you made it into a wreath, rather than the traditional cake. The entire shower is gorgeous. I love owl themed baby showers. I'm sharing your shower on my facebook page. Thanks so much for sharing at Whimsy Wednesdays.